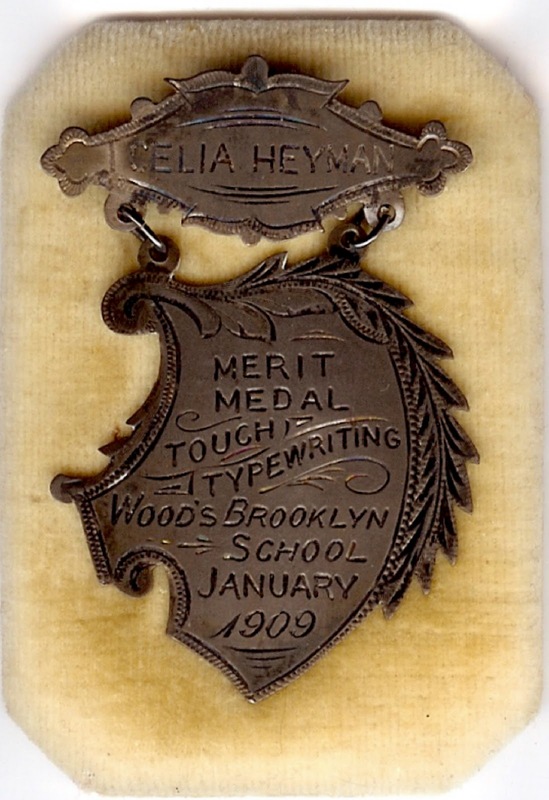 My grandmother, Celia Heyman Marks, was a whiz at the typewriter. Because she mostly used manual typewriters all her life (she was born in 1894), she had incredibly strong fingers and hands. The story goes that at the New York World's Fair in the early 1900s, she broke one of the first electric typewriters (which were first mass produced in 1902) because she typed so fast. On a manual typewriter, I know she exceeded 125 words per minute for an extended period. I believe the world record is 147 wpm for an hour. There was much more to my grandmother - she was smart as a whip and loved word games. Here she is and below her photo is a photo of her typing medal in 1909 from the Wood's Brooklyn School of Business and Shorthand.